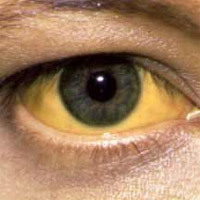 Jaundice is described as yellow discolouration of the eyes, which may be accompanied by deep yellow coloured urine. Usually patients have decreased appetite. Jaundice per se is a symptom but not a disease. Inflammation in the liver is hepatitis and is the most common cause of jaundice. This is the most common cause of jaundice in the community. In majority of patients the disease has got a self- limiting course. Very few patients have a fatal course and need for hospitalization. Hepatitis B & C are transmitted via infected blood and the liver completely recovers, However, some patients of HEPATITIS B & C GO INTO CHRONIC HEPATITIS AND CIRRHOSIS. HEPATITIS A & B can be prevented by VACCINATING the person against it. There is no vaccine to prevent hepatitis C. Hepatitis B and C can be prevented by using SAFE AND SCREENED BLOOD, which is negative for these viruses. Swelling of feet and abdomen. This condition can be prevented by limiting the quantity of alcohol intake to 2-3 pegs/ day. Those who drink daily should refrain from drinking at least 2 days in a week. This gives time for the liver to recover from the toxic effects of alcohol. Stone in the bile duct. These patients should be property investigated to diagnose the disease at an early stage. Most of the times the disease is detected at an advanced stage and cure them, is not possible. NON SURGICAL THERAPY WITH THE HELP OF ENDOSCOPES IS NOW AVAILABLE IN EXPERT HANDS.